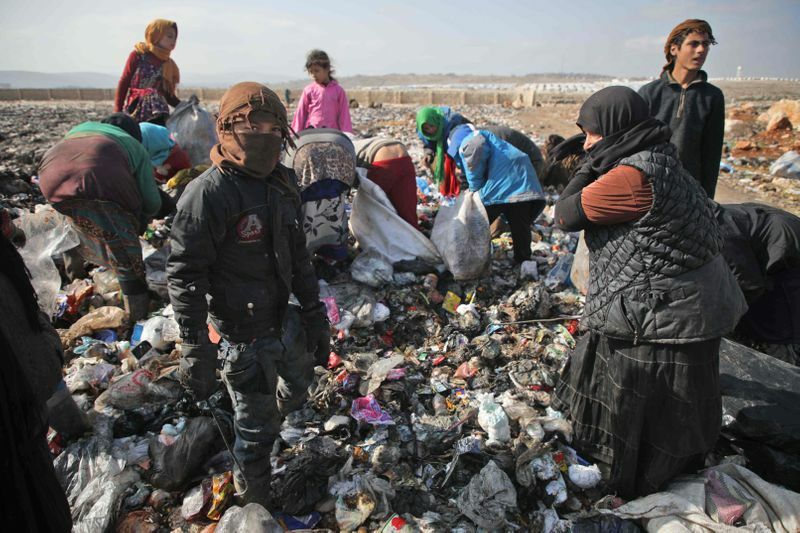 Kafr Lusin, Syria: Outside a camp for the displaced in northwest Syria, 15-year-old Sabaa Al Jassim hacked away at a mountain of trash hoping to find scraps to sell for food. 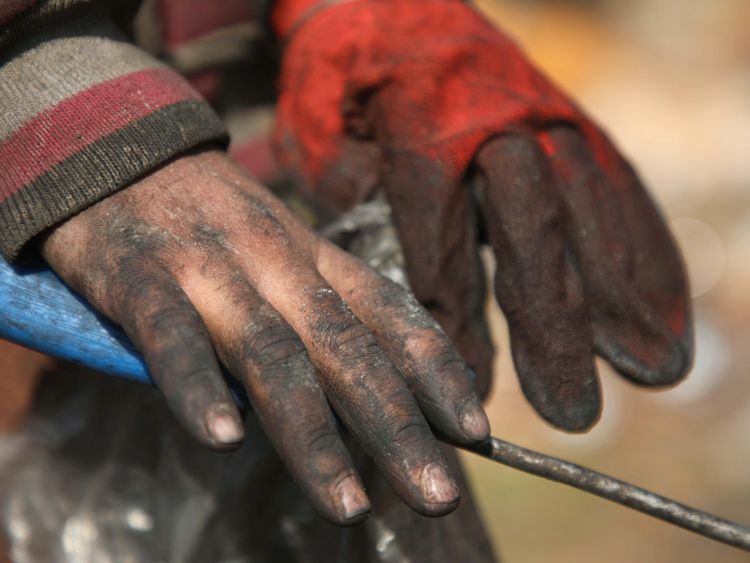 Using a hooked metal rod, he stabbed at acrid household waste in the village of Kafr Lusin, looking for plastic to trade for a few dollars to feed his 11-member family. “I go to the dump to support my family,” said the teenager, dressed in a dark jumper and rubber boots. “I collect two bags of plastic a day so we can buy bread,” said Sabaa, who hasn’t been in school for most of Syria’s almost eight-year civil war. With a sick father, an overwhelmed mother and a wounded older brother, he and three of his younger siblings are left to fend for the family’s survival. Of the three million people who live in the surrounding militant-ruled bastion of Idlib, around half have been displaced from other parts of the war-torn country. Many depend on aid, but at the informal camp of some 50 families in Kafr Lusin, the man in charge said food baskets are few and far between. At the dump nearby, dozens of women and children gathered around a garbage truck as it slowly tipped out its stinking contents. With a rod, a veiled woman sifted through the fresh round of trash - empty aluminium cans, food scraps, and sullied nappies. With his 12-year-old sister Bahriya and nine-year-old brother Rajeh by his side, Sabaa filled up a sack. Together with a fourth sibling, he said, they usually manage to make around 1,000 Syrian pounds (around $2) a day. With it, “we buy bread, potatoes, vegetables, and tomatoes”, he said, but there’s never enough for meat. Around them, most of the children walked around in rubber boots, and the luckiest also wore at least one thick glove. Others ploughed away with their bare hands. Woolly dark grey sheep nuzzled through the detritus, in search of something to eat. Back in the family tent, Sabaa’s 17-year-old brother lay under a warm blanket, his wounded leg held in place by a shiny metal rod. A stove warmed the tent made up of a patchwork of torn sacks, its chimney jutting out of the canvas and stretching towards the sky. Sabaa’s father Jassim said he hates sending off his children to work, but his family has no other way to support itself. But “if they didn’t, we would starve”, said the 53-year-old from the central province of Hama. The UN’s World Food Programme says around 6.5 million people are unable to meet their food needs in Syria, most of them internally displaced by the war. The conflict has killed a half a million people and led millions to flee their homes since starting with the brutal repression on anti-government protests in 2011. Jassim said he cannot help his children because he is weak after a heart operation. “If I wanted to walk 50 metres (yards), my legs couldn’t carry me,” said the bearded father, wearing a red-and-white scarf on his head. As for his wife, she has a disabled son to look after and has to make meagre supplies stretch to feed and do laundry for nearly a dozen people. “She can hardly find enough to cook or wash with,” he said. 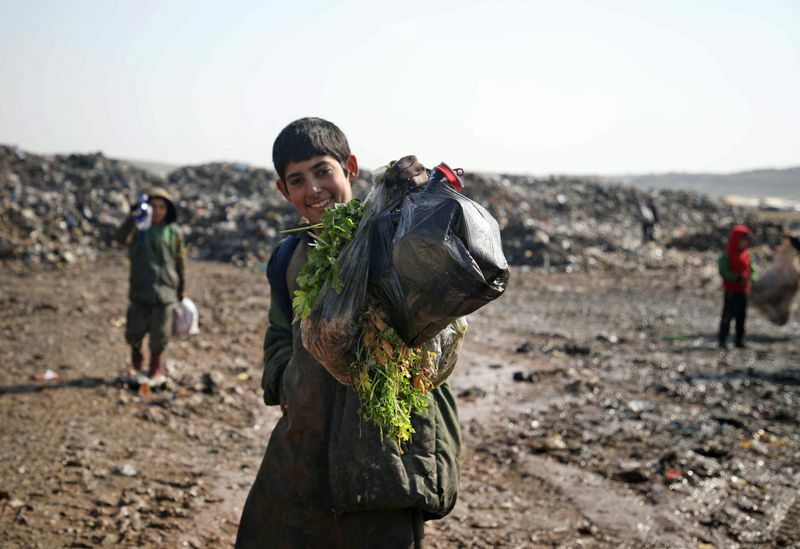 After sorting through their pickings, Sabaa and his siblings carried them over to a neighbour, who gathers the trash over a week before selling it in the nearby town of Atareb. Murhaf Hejazi, a 25-year-old father of an infant boy, said he too trades in rubbish out of necessity. At a store in Atareb, he sells a kilo (two pounds) of plastic for 125 pounds (around 20 US cents). Eventually, the plastic is recycled, he said. “Copper fetches the most money, but here there’s mostly nylon and plastic so that’s what the kids bring,” he said. Of the 10 people who bring trash to his tent each day, “most are children”.